March 19, 2019 (Lincolnshire, Ill.) – Klein Tools (www.kleintools.com), for professionals since 1857, introduces the 2-in-1 Impact Socket Set, which includes 12 common impact socket sizes used in utility and construction applications. Its six sockets feature hands-free adjustment between sizes to help save time on the job. 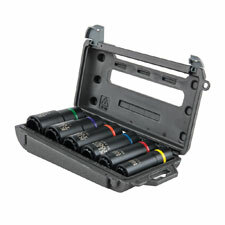 This convenient tool set extends Klein Tools’ existing line of Impact Socket Wrenches.